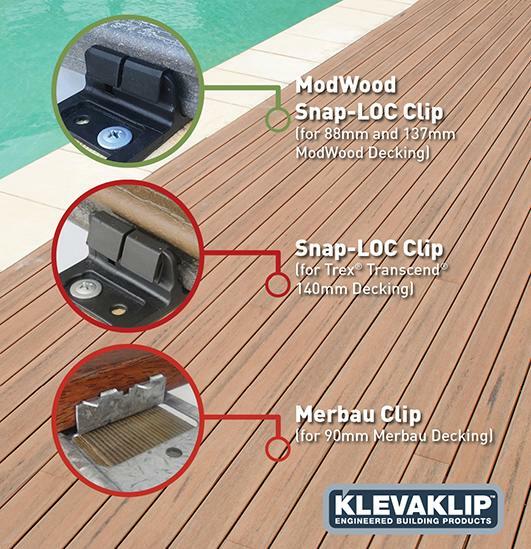 KlevaKlip is Australia’s only multi-board, fixed-pitch decking system – the clip controls the spacing of the boards, with each clip simply butting up to the previous one. This makes our system quick and easy to use when compared to other systems in the market. KlevaKlip does not try and sell a “one product fits all” approach. This simply doesn’t work. Although many of the principles of our clips are the same, the actual clips for fixing ModWood, Trex and Merbau/Kwila are specifically different. KlevaKlip has been supplying our traditional metal clips to suit ModWood Natural Grain Collection Decking into the Australian decking market for over ten years, with many millions of clips having been installed on decks. Approximately half the ModWood decks laid in Australia are done so with KlevaKlip – the other half being laid using traditional screws or nails. Our new clip, the Snap-LOC clip manufactured from High Quality Engineered Impact Modified Nylon, for ModWood Natural Grain Collection decking, is two to three times faster to install than conventional “biscuit-type” decking clips. KlevaKlip has developed and released a clip for the Trex® brand of composite decking. Trex® dominates the USA composite decking market and in recent years has made inroads into the Australian decking market, as more people make the decision to go to the extremely low maintenance composite decking in favour or traditional timber decking products. For merbau/kwila decking, KlevaKlip merbau clip allows you to purchase and use decking boards “off the shelf” without the need for deep grooves in the sides of the boards which are not only expensive and time-consuming, they can in some cases affect the integrity of the side edges of the boards. Introduced in 2010, the merbau clip has been used on many thousands of decks across Australia. Why ModWood, Trex® and Merbau? 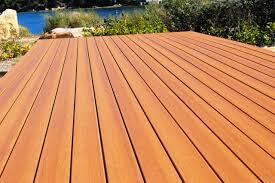 ModWood is far and away Australia’s most popular wood/plastic composite decking board. 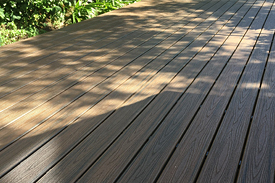 Being Australian made, and already having considerable longevity as a company/product, people have the confidence that ModWood can fulfil all their long term decking needs. The KlevaKlip “ModWood clips” have been tailor-made to fit the ModWood 88mm and 137mm decking boards, each of which have a shallow groove in the sides of the boards. These clips will not fit other brands of composite decking boards. Trex® is the world’s largest selling WPC decking. 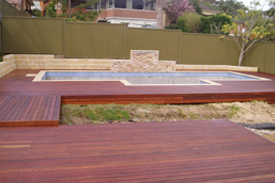 Whilst not an Australian made product, it is renowned throughout the decking world as being a high quality product. As such, Trex® is gaining considerable market share in the Australian decking market. From KlevaKlip perspective, we believe our (ModWood and Trex®) clips cover the two most respected (and largest selling) wood-plastic composite decking boards sold in Australia. Merbau/Kwila is the largest selling hardwood decking timber in Australia. The KlevaKlip “Merbau clip” has been designed to suit the size, hardness, density and shrinkage rates of 90mm merbau/kwila. It is not designed for use with other timbers. As previously mentioned, we do not believe in the “one product fits all” approach to our clips – that’s why they work! There is one main reason why people use a concealed fixing system - they love the look! The undisputed appeal of concealed fastening allows you to see the natural beauty of your decking boards, not the cluttered look of thousands of fixings. Now that's clever! Unlike most concealed fixing systems, KlevaKlip is actually very quick and easy to use - even if you are not an expert. Time studies have shown that laying your deck with KlevaKlip can give you at least 50% time savings versus traditional pre-drilling and screwing your decking boards. Our continuous clipping system is also significantly faster that the biscuit-type clips that many composite decking boards use. 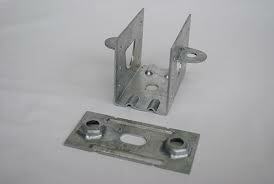 Our clips also can be used equally easily with Timber or Metal Joists. Clever builders simply won't use anything else but KlevaKlip. Did you know that most manufacturers of steel joists do not recommend fixing decking boards direct to the steel joist - advising to fix a timber batten first? 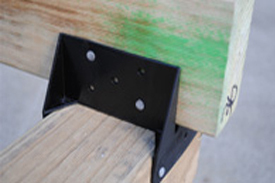 KlevaKlips have the huge advantage that they can be used directly onto either timber or steel joists without problems and without building unwanted stresses into your deck. KlevaKlip are the recommended fixing for Lysaght steel joists. With no nails holding your boards down, your risk of stubbing your toe on a nail that's popped up is eliminated.. This reduces splinter and trip hazards - making your deck safer for small children and adults alike. Not only does KlevaKlip help prevent water damage to boards and joists caused by water permeating screw and nail holes, the absence of top fixing means that you can re-sand your timber decking boards without having to re-screw/punch every fixing on your deck . Now that's a clever time-saver! Provides a long lasting, Professional Finish. For the professional deck builder - you can "get in, do a great job, and get out". No call-backs!! For the home handyman - a professional looking job that you can be proud of.